This promo only single was released by Universal Norway in August 2007. It does not come with a picture sleeve. 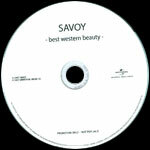 The disc is white with black text, including the words "Promotion only - not for sale" at the bottom of the disc. It doesn't have a catalogue number.